Mine Blaster 1000 was originally an attempt to create Minesweeper without using anything but formulas and formatting (no VBA). But, it evolved into something a bit more interesting. Instead of trying to avoid detonating the mines like in Minesweeper, you use small blasts, large blasts, and sensors to try to detect, damage, and destroy the mines from the field. Each of these tools costs money, so the challenge is trying to clear the mines using the optimal set of tools, before spending your $1000. Mine Blaster 1000 is a fun game, but keep in mind that I specifically intended NOT to use any VBA. So, while we can certainly think of ways of improving this game by adding a few macros, the intention here is to showcase what can be done exclusively with formulas and formatting. The cells that make up the mine field use multiple conditional formatting conditions to determine how much a mine as been damaged and to add the color-coded proximity indicators. 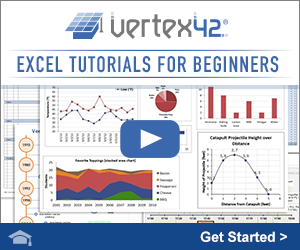 The worksheets are not password protected or locked, so you have full access to view all the formulas. This game is extremely easy to play, just like good ol' Minesweeper. But, winning the game is not always easy. It's kind of a cross between Minesweeper and Battleship, but your bombs or "blasts" have an area effect. 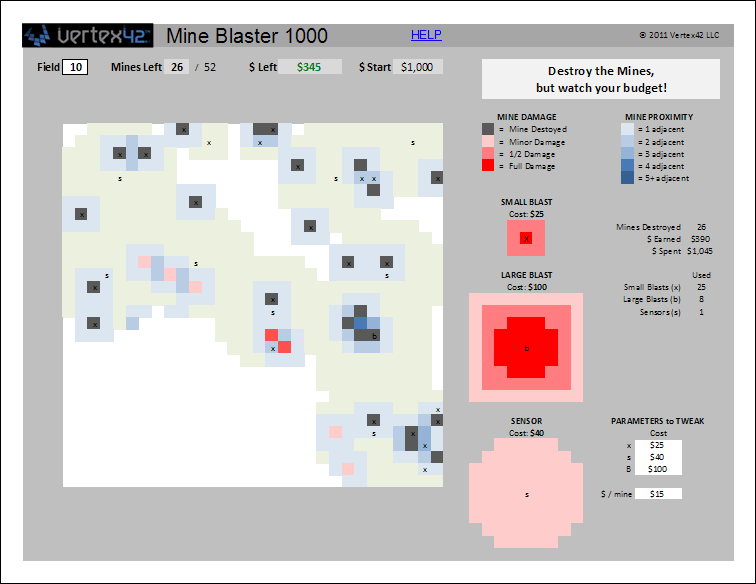 You set up blasts by entering an "x" or a "b" in the mine field. I have no idea whether this technique would work in the real world or not ... this is just a game remember. You can also deploy a sensor by entering an "s". After you've completed a game, you simply delete the letters from the mine field and choose a new field ... or try to get a better score on the field you already cleared. To quickly clear the mine field, select all the cells in the mine field and press Delete. Small Blasts - Cost $25. These have a small blast radius, but how you place them is often the key to winning. Hint: Placing the blast directly on a mine may not always be the optimal solution. Large Blasts - Cost $100. They're expensive but they do a lot of damage. Sensors - Cost $40. These can detect mines over a large area, but they don't do significant damage. Remember to use the proximity indicators to help you know where to place your blasts. This part of the game is very similar to Minesweeper. Use the legend on the side of the mine field to remind you what the colors mean - the darker the blue, the more mines are adjacent to the cell. Should you use a sensor, a large blast, or a chain of small blasts? I've tried to design the game such that you can't JUST use small blasts all the time and you can't JUST use large blasts. What you use will depend on the # of mines in the field. For example, if there are very few mines, you don't want to be wasting the money on large blasts that do no damage. Given that this game was conceptualized, created, and play tested over a 2-day period, I'm sure it's going to need some tweaks. There are 20 pre-defined mine fields that you can select by changing the number in the Field cell. You can also create your own random mine fields with more or less mines. Use the Fields worksheet tab to create custom mine fields. To make the game harder or easier, you can adjust the costs of the blasts and sensors, or the reward for destroying the mines. I've tested the first 10 levels, so I know that it is possible to win the game when starting with only $1000, but I'm not sure about levels 11-20.